Almost two years ago my wife and I were blessed with a baby boy. We were happy. She got her kid and I got to stop hearing her ask when we were having a kid. Win-win. Life was good. Then last month I found out it was going to happen again. One would become two. On a serious note, Dad is the best occupation in the world. It can be hard work, but pays in ways hard to describe. What do my baby making skills have to do with cars? A single child doesn't really impact vehicle selection much. While it rules out two-seater cars (so long Miata dreams), any other car with a backseat will get the job done. Two children, especially in a family that is road trip inclined, starts to push the limit of even some medium sized vehicles. You’d be amazed at how many bulky items become required cargo on a weekend getaway when kids are in tow. Pack-n-plays, jumpers, semi-portable feeding chairs, sleeping contraptions, toys, toys, toys...more toys. BEEP, more toys?!? Oh, let's not forget the Smart ForTwo-sized off-road jogging stroller with all-terrain tires. My wife and I decided we’d start looking at vehicles capable of accommodating two child safety buckets, a possible grandparent and the Baby on Board freight. In other words we could buy a Mazda5 or a MazdaFive. For parents a sliding door means 100% access to the back seat and child-loading bliss. Imagine a 5’2 125lb (you’re welcome honey!) woman leaning down into the rear door opening of a sedan. She's trying to stuff 35lbs of kid & carseat shaped like a unsolved Rubik's cube into an opening that looks like a deformed boomerang, all while keeping the door from fully opening and attacking the S-Class in the adjacent parking spot. This takes skill, art and endurance. Sliding doors are also a great money-saving investment. It prevents those costly “did you just kick open your door and hit that expensive Italian supercar?” incidents. To those that are bound to say “Just buy a minivan, crybaby!” let me respond - NO. I want a V8 (or twin-turbo 6), off-road talented, hunk of metal that is 100% SUV...but with sliding rear doors. Range Rover with sliding doors? Yes please! This did get me thinking – why are sliding doors relegated to minivans? 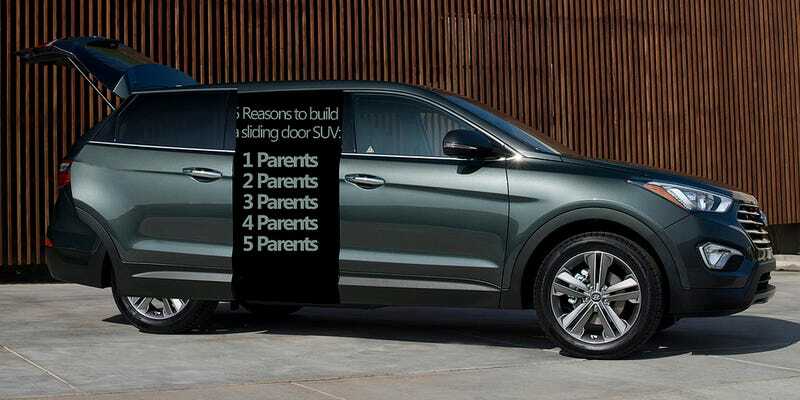 I'm sure a survey of current utility vehicle owners, who also own children, would conclude unanimously; rear sliding doors are amazing and highly-desired on sport utility vehicles. I’m sure there are many factors to consider – added weight, added cost, design challenge with a sliding track, potential impact on capabilities, fuel economy and many other factors that my lack of automotive engineer prohibits me from assuming. Question for the merciless comment critters below: Do rear sliding doors have a place on sport utilities and would you buy one that had them?